For continuous level measurement of liquids (even if polluted), mash and paste materials in open or closed vessels, sumps, open channels, etc. Ultrasonic level meters ULM® is self contained device that includes electroacoustics transducer and electronic module. The level meter ULM transmits series of ultrasonic pulses which propagates towards the liquid surface. Reflected acoustic wave is received back in the ULM transducer and processed in electronic module. The distance calculations are based on time of flight of the acoustic wave to the level and back. Measuring range from 0.25 m to 2 m, plastic PVDF transmitter and plastic body (PP+HDPE), process connection with thread G 1″. Measuring range from 0.25 m to 6 m, plastic PVDF transmitter and plastic body (PP+HDPE), process connection with thread G 1 ½”. 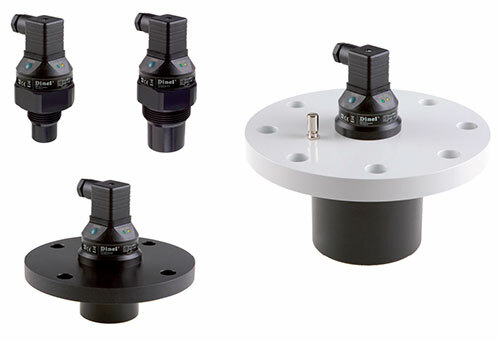 Measuring range from 0.5 m to 10 m,plastic PVDF transmitter and plastic body (PP+HDPE), aluminium alloy (“Xi” version) or HDPE (“N” version) flange.